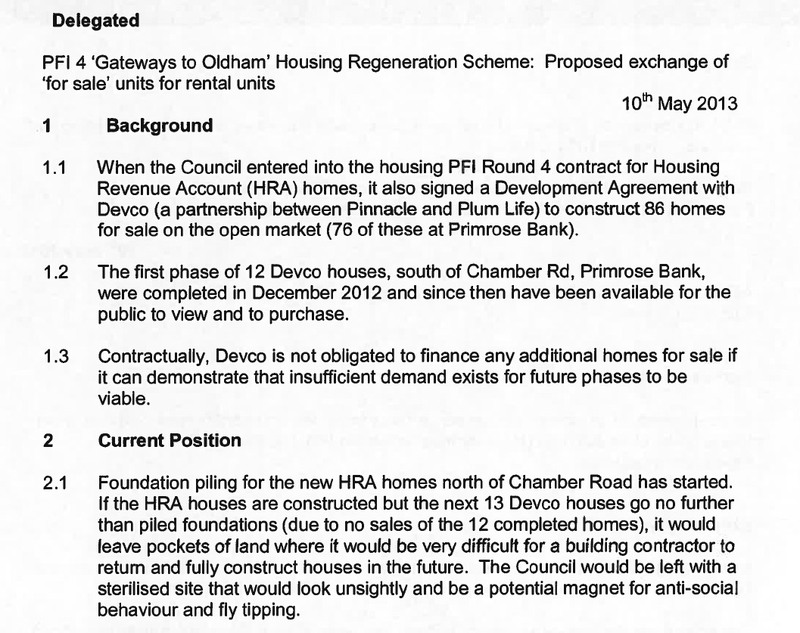 Oldham Council is building another 16 PFI houses at Primrose Bank despite Devco pulling out of the scheme two years ago because they could not sell a single new house built. Oldham Council is tendering for the “construction of sixteen houses for private sale in order to complete one section of the Gateways to Oldham PFI project (Primrose Bank)”. So here we are again with Oldham Council under the leadership of our tinpot dictator and selective demographic community champion Jim McMahon still insisting on adding to housing in Werneth despite a previous phase of twelve homes for sale being redesignated as rental properties because they did not sell. Oldham already has a one billion pound twenty five year PFI debt & interest repayment bill but the Council’s insistence in more PFI houses for private sale at the same failed location, the less than desirable Primrose Bank, speaks volumes about population expansion plans & the use of social rental properties to drive forward said expansion. Property developers Devco pulled out of the scheme two years ago because they could not sell any of the twelve homes they built for sale. The Labour Council’s insistence on building almost all new PFI housing in areas with various combinations of the highest birth rates, migrant increases, unemployment rates, high crime rates, community tensions and social/cultural introversion has led to new house prices in Oldham falling by 17% to the lowest in all Greater Manchester whilst birth rates and poor migrant numbers are consistently the highest in Greater Manchester and outnumber new homes built by a huge margin.